How are all the other participants going with keeping up with the challenge? I'm actually a few days in front, because I allowed myself to start a few days earlier so I wouldn't feel the pressure of having to create nail art the day before I posted it to my blog. Lucky, though, cause I actually took a couple of nights off painting my nails over the weekend. First was to have a movie night on the sofa with hubby and then last night because I was busy editing videos. I recently purchased a little gadget that allows you to connect a VCR (!) to your computer via USB. This allows you to make digital copies of any of your old family videos or recordings. It was awesome to sit there going through a bunch of old family videos from nearly 30 years ago. It was amazing to see the technology that we used back then (eg the massive video camera that mum had to lug around on her shoulder). Some of the most special parts was seeing old kitties which I grew up with and and seeing video of my Nana and Grandad, who both passed 15-20 years ago. I'm so excited to go through all the videos we have just sitting around collecting dust and seeing what is on them. No onto today's nail art. 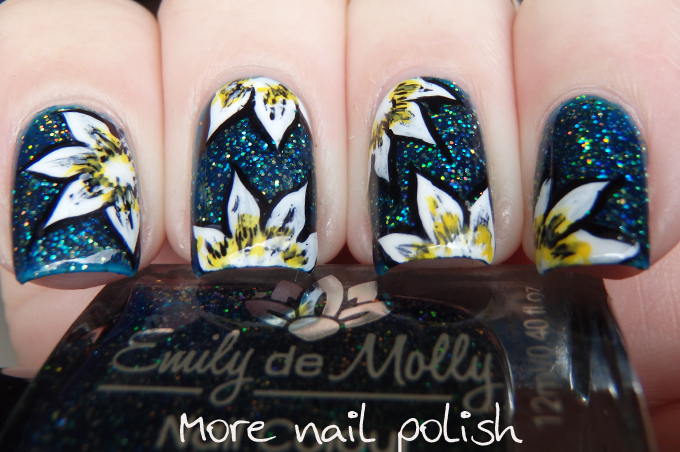 I'm not actually sure what sort of flowers these are that I painted onto my nails, but I don't think it even matters. I just love how this came out. I started with a base of Emily de Molly Splendid Vision (more swatches of it on it's own below). I then free handed the flowers on using white nail polish. 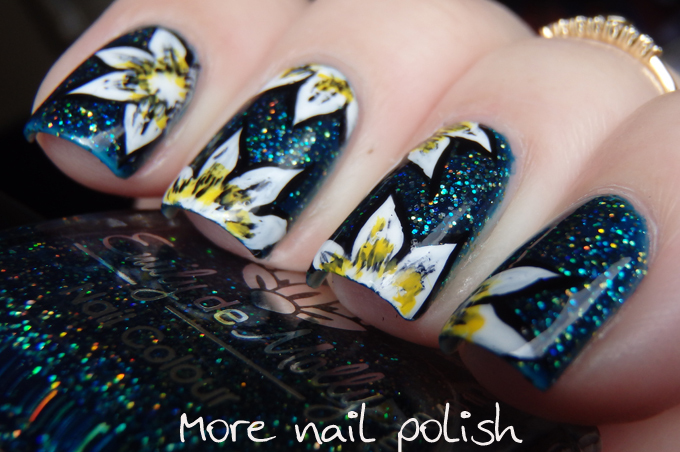 I then added the black lines around the centers and outlined each petal with black polish. 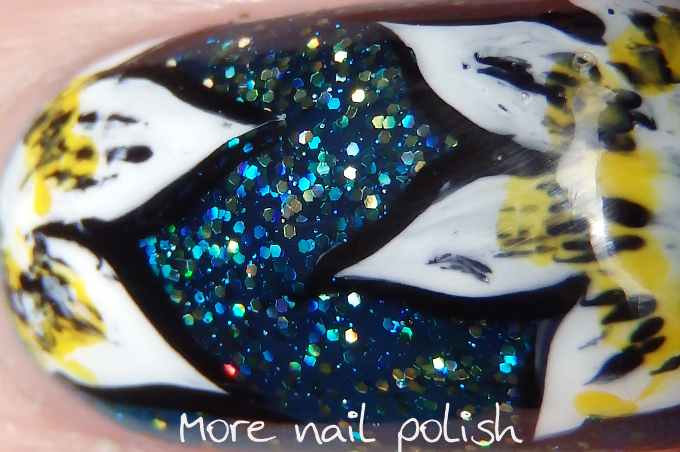 I finished it off with a few yellow highlights to accent the gold ultra holographic glitter in the base polish. 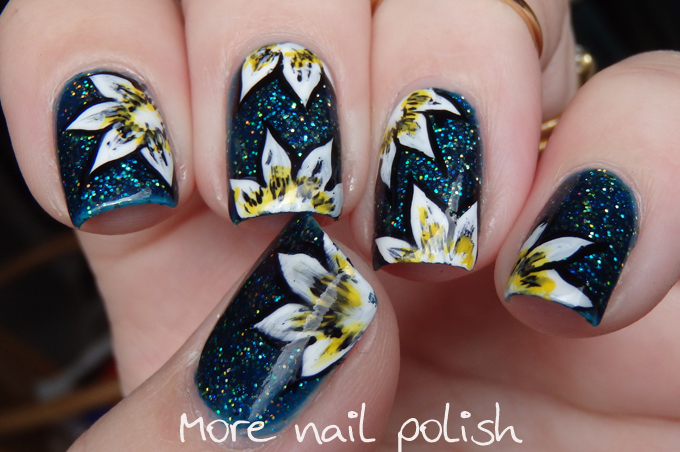 My flower nails from 2013! I also have some bonus before shots of just the base polish by itself. 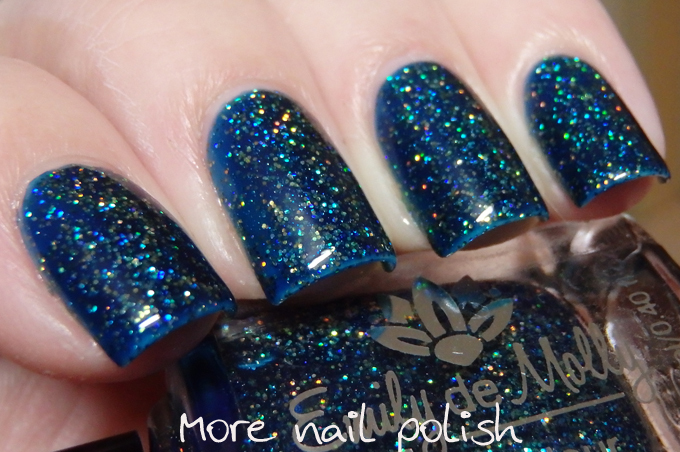 This is Emily de Molly Splendid Vision, which has a dark blue/teal jelly base and is jam packed full of ultra holographic gold glitter. It is simply stunning and sparkles so much more than photos can capture. 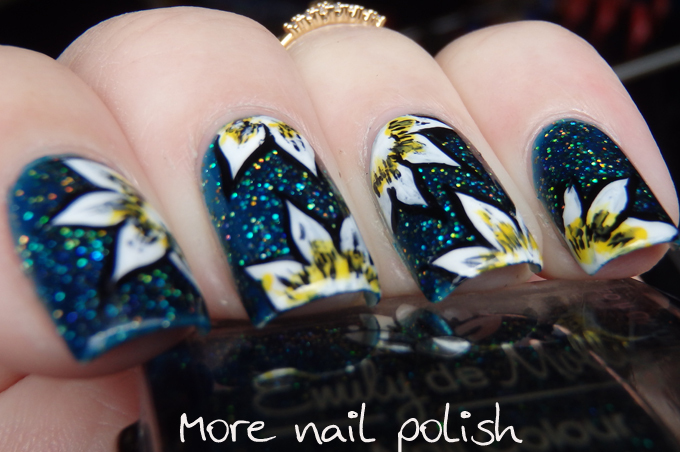 Wow I don't know which I like better the flowers or the polish, both are stunning. 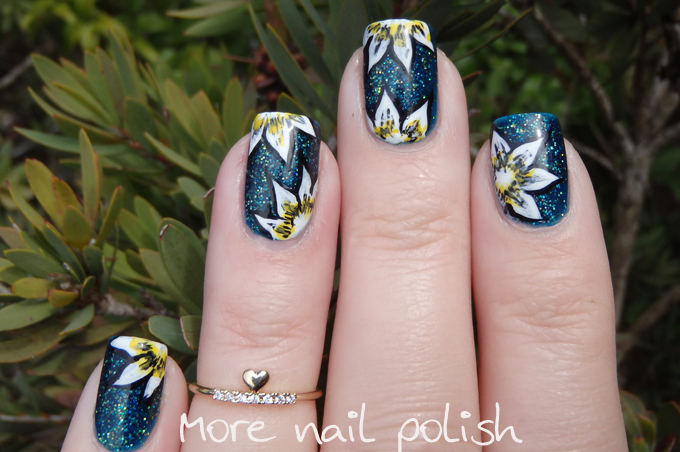 Love the flowers over the Holographic polish! Beautiful! !